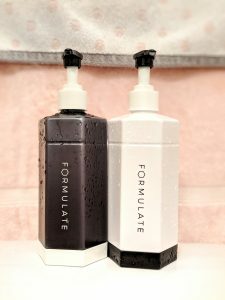 Let me introduce you to Formulate Co.
Formulate Co. is a cruelty free, environmentally friendly haircare company that creates a custom shampoo and conditioner formula based on your hair type and the concerns you wish to target and fix. The materials used for the bottles are environmentally friendly and the formulas are naturally derived. Their products are also paraben and sulfate free. 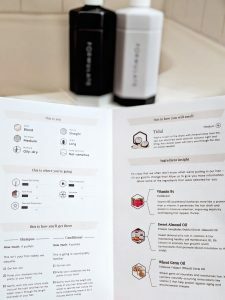 Formulate is all for recycling and reducing waste, so if you happen to receive a re-formulation, your previous one can be used as a cleaner (I have a few sets :P)! Formulate is the first custom haircare system that allows you to select the top 5 “benefits” you need for your hair. You can choose from benefits such as volume, color care, dandruff control, split end mending, moisture, and so many more. The process is super easy. 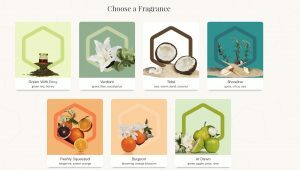 You’ll fill out a hair profile with the details of your hair, select your main concerns, and then choose from a selection of scents (shown below). Formulate is driven by individuality, positivity, and improvement. They want to help you end the “guess and test” way of buying and trying hair products. Their goal is to create a product that’s perfect for you so you don’t have to keep guessing. They currently only have shampoo and conditioner, but additional products are in the works. It’s important to me to protect my hair in every way I can. If I’ve paid for a color service, I want the color to last and stay vibrant for as long as possible. 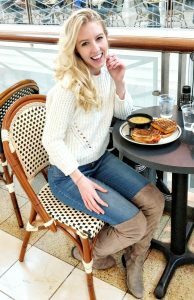 I want to keep my hair healthy when using heat – i.e. 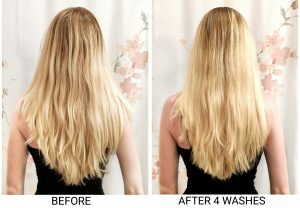 curling wand or blowdryer – to prevent split or broken ends. And I love for my hair to be soft and smooth after it’s been washed. So with my hair profile complete, I sent in my order and awaited my first custom set in the mail. I’ve loved having the opportunity to partner with Formulate on this post. The shipping and packaging is great, the products are awesome, and the team is amazing. I had a bunch of fun taking the photos and getting creative with my pictures. I hope you guys are as excited about this as I was! Continue reading below. Shipping is super fast, so once your order has been placed, your set should arrive within a couple days! 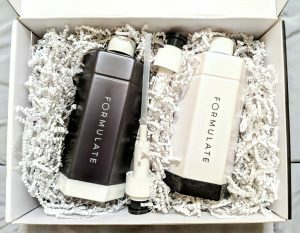 Getting your Formulate package in the mail is super exciting. It’s like opening Christmas gifts all over again! Only this time you have the anticipation of knowing what it is and looking forward to using it right away. I mean who wouldn’t be excited about getting something custom in the mail, right?! The packaging is simple, sleek, and modern. I LOVE the black and white, clean-lined hexagonal packaging of the products. The pumps can be hard to twist to get them open sometimes. So what I did was held the thick white part under the cap with one hand, and twisted the black top with the other until it popped. Once you have your pumps unwound/open, remove the tops from the bottles and replace them with the pumps. I saved my lids and boxes for when I travel and need to take my set with me. It makes it so much easier than trying to pack with the pumps and hope for no mess. And you can fit a few other products in the box with your set to save more room when packing too! Or if you don’t want to bring the full bottles of shampoo and conditioner, just use the box to put all your toiletries in, or decorate it and use it for storage. The first formula I received didn’t quite work out for me. The conditioner was watery and not thick enough, there was TOO much volume, and I didn’t care for the scent. But I discussed it with my rep Sam and he was able to have all three of those aspects changed with no problem. My conditioner was thicker, the volume benefit was reduced, and I chose a new scent. I think the hardest part about my experience was definitely choosing a scent. The scents are natural, non artificial smelling, so they’re not the kind of scents you’re typically used to in shampoo and conditioner. The first scent I chose was At Dawn – green apple, pear, and rose. It sounded delightful, light, and fresh. But since the scents are not your traditional smells you’re used to, it wasn’t what I expected. You’re able to choose the strength of your scent as well. You can choose light, medium, or heavy depending on how strong you want your shampoo and conditioner to smell. I chose medium. The next scent I chose was Burgeon – orange blossom – because I wanted something more floral. I was contemplating the Verdant scent with lily, but was afraid the eucalyptus would have an overwhelming mint smell. The Burgeon scent was more of a fresh, vibrant citrus scent. Almost like fresh squeezed oranges. It was for sure a delight for your senses. Yet I was still curious about scents, so I tried one more scent, which was Tidal – sea, warm sand, and coconut. This one was a winner. It made my hair smell fresh, clean, and delightful without being too overwhelmingly coconut. I only wash my hair every other day, or every third day sometimes. I do two pumps of shampoo and lather on top of my head, my scalp, and the top of my hair. Then I use another one or two pumps to lather the bottom half of my hair. I like to feel the product throughout my hair so I know I’ve covered it all and not missed a spot. For conditioner I do three to four pumps and work my fingers through my hair from the top of my neck and to the ends of my hair to make it smooth and easy to work with. I do not use conditioner on my scalp or roots. It’s ok, I experienced that myself and had to get answers. The first few times you use the products your hair will likely feel greasy, thick, and heavy like there is residual product left. Once again, I consulted my awesome, all-helpful rep and he explained that this is because Formulate is currently silicone free, an ingredient that makes your hair feel clean. 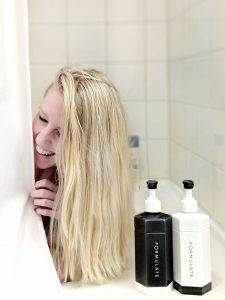 “When a [silicone free], sulfate free, paraben free, and sodium free product enters your hair, the pores in your hair go into shock mode.” No need to worry – your hair should adjust! The team is very responsive and incredibly helpful. They are always there for you if you need help or have any questions. (Shoutout to my rep Sam C for being helpful, patient, informative, and all-around amazing!) They have an impressively quick response rate, and they are very knowledgeable on anything you may need. If your representative doesn’t know the answer, he/she will find someone who does, and get you an answer. If there are any issues with your formula, they are there to help. When my conditioner was too runny and I didn’t enjoy my scent, they were quick to get it adjusted and shipped back out. Shipping is always free, so you’ll never have to worry about paying for a set to reach your door. 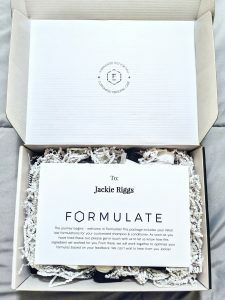 You should also receive a survey by email that allows you to explain your experience with Formulate, and describe how the products have been working for you. They will then use your responses to make sure they got your formula perfect. As with any product analysis or review, what good is it without photos of the results?! I took a photo of my hair air dried and brushed before I started using Formulate, and then after 4 washes, also air dried and brushed. Here were my results. After just one wash my hair felt thicker and fuller. I did notice in increase in volume when using the products. The color protection seems to be doing well as well – my color doesn’t seem faded or changed. I haven’t been noticing many split ends or breakage, which tells me that the split end mending and heat protection seem to be working too! I may still have some perfecting to do, but after getting past the silicone-free, gunky hair feeling, my hair feels new and fresh and smells fantastic. That’s it! The winner will be announced and contacted on February the 17th. Keep an eye on my stories to see who won! P.S. 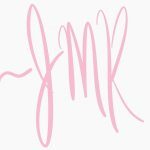 Make sure you check out my Instagram stories and Giveaway highlight to see more!